In 1989, a marvelous partnership was formed between Cummins and Dodge. With consistent excellent quality and outstanding customer service, this partnership is still going strong today. This dynamic duo is celebrating their 25th Anniversary between Cummins and Dodge. 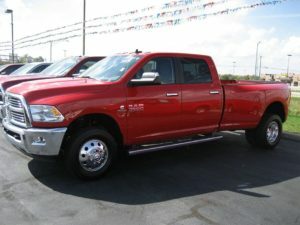 In celebration of this monumental event, they have created a special package for the 2014 Ram Heavy Duty pickup trucks. They are offering these commemorative vehicles with some impressive accessories for the new truck buyers. These commemorative packages come with one time special customer pricing. The Mega Cab and Crew Cab models retail for the low price of $2,195.00, and the price for the regular cab models is $2,195.00. These prices are a small price to pay for the lasting craftsmanship and engine reliability. For the price of $1,000.00, clients looking for added comfort can have cooling units installed in the seats. For the drivers that live in the colder climates, heated seats can be installed for $300.00 if the truck is not already equipped with them. All of these quality features can be included and quickly get the driver out on the road in style. There are some impressive customer comforts that come included in this commemorative package for the new Ram Heavy Duty. For passenger comfort, this new truck package has a lot to offer. There are custom floor mats to keep the floor of the cab clean. For prevention of rust and for esthetics there is a hitch cover included. The exterior of the truck is further adorned with exterior badges announcing the 25th Anniversary special edition truck. Another small touch that lends tribute to the special event is the stand out commemorative red engine cover. When inspecting the inside of the stylish cab of these trucks, such additions as custom embroidered “25th Anniversary” logo on the seats and Katzkin leather seats throughout. All of these added high-end accessories have made this edition of Ram truly a celebration of success. When speaking of quality and reliability, Dodge and Cummins come to mind immediately. With the success of their 25th year in business together, this team has developed a must have 2014 Ram HD model with special Anniversary accessory additions. With an impressive motor capability, custom interior, exterior special anniversary touches, and unbeatable bottom dollar pricing, this special edition of the 25th Anniversary Cummins Dodge Ram HD is a must have for any true Ram enthusiast. ← Do I Have a Fuel Leak?